For integration of e-commerce systems, Paylink provides a reliable, flexible hosted payment system that does not require the merchant to setup secure forms or secure servers. Merchants can easily use their existing e-commerce system/store and Merchants can simply forward a token of data for processing and the Paylink system will communicate direct to your customers. The Paylink system will forward a response from the completed payment for your systems to deal with accordingly. 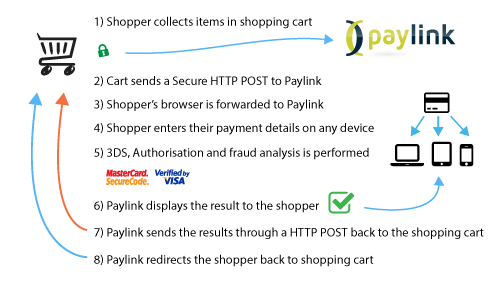 Paylink is a fast, flexible secure and easy to use online payment form system. Paylink makes online e-commerce safer by handling the card payment process direct with the card holder and the processing bank. Customisation may be performed on the secure payment form providing a look and feel to link with your site. Surcharging facility. Automatically add a percentage or fixed fee based on the card type. The transaction is submitted for processing, passing through validation including 3d secure authentication, fraud checking and then on to the acquiring bank. Authorisation is obtained from the bank and entered into the CityPay database for subsequent settlement and reporting. Where CSC and AVS matching is required the transaction result is checked and accepted or declined based on the outcome. The result is displayed to the shopper. If rejected or declined, an option to reprocess is enabled using a different card or amending the details. The result is returned to the merchant by returning the browser to the merchant's site. At this stage a HTTP "postback" to a Merchant URL is also performed and an email notification is sent to the merchant email address supplied with the request. Merchants who are looking for an easy to use 3d secure enabled payment system will find that there is no additional integration required to use 3d secure as RFA Secure is seamlessly integrated into the Paylink application.